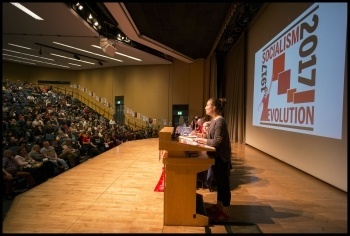 Over 1,000 workers, young people, campaigners, activists, trade unionists, students and international guests gathered in central London on 11-12 November for Socialism 2017. It felt clear to all that this was our biggest event to date. The serious, determined and enthusiastic mood was contagious and left many wanting to get even more stuck in to the battles in workplaces and communities across the country. 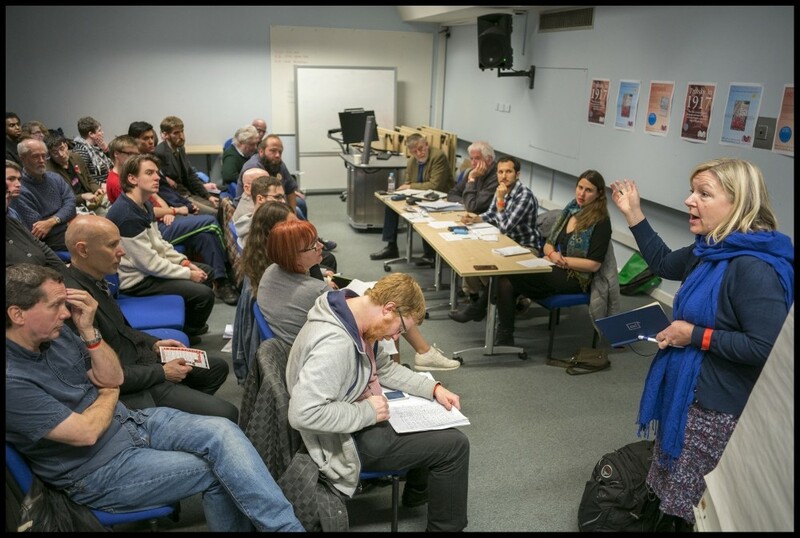 We celebrated the centenary of the Russian revolution throughout the weekend and were inspired in particular by the work of our sister parties in the US and Catalonia. 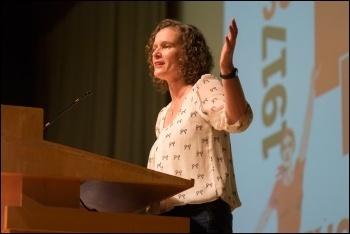 But as Hannah Sell, Socialist Party deputy general secretary, pointed out in the closing rally, this wasn't just about the far away or the historical. Socialism 2017 was about taking those lessons and using them in the here and now. The financial appeal at the Saturday night rally raised over £42,000 and many joined or expressed an interest in joining the Socialist Party. Behind the platform, moving pictures. Petrograd workers in black and white. Marchers today in colour. Their impatient strides the same. "Who would believe that the janitor or watchman of the court building would suddenly become chief justice of the court of appeals, or the hospital orderly manager of the hospital?" The lamentations of a tsarist general opened the Rally for Socialism in the centenary of the Russian revolution. Chairing was Sarah Wrack, editor of the Socialist. "The Bolsheviks, under the leadership of Trotsky and Lenin, had believed it. And they fought for it. And they led the working class to win it." 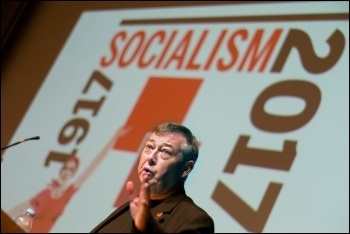 But Peter Taaffe, general secretary of the Socialist Party, noted that "now we find the revolution and its lessons are ignored." Why? "Because revolution is on the agenda." The profit system is turning inside out. We are "regaled every day by a blizzard of facts" such as in the Paradise Papers. "This is not tax evasion or avoidance. This is theft - on a gargantuan scale." The bosses are wrestling with their own panic. The ruling classes face "massive" splits "on a world scale." In the US, Donald Trump "could split the Republican Party." The world left renaissance could also split the Democrats. And in Britain, Labour "remains two parties in one." "Of course we support Jeremy Corbyn's anti-austerity programme. But," Peter asks of Jeremy Corbyn, "do your own members" - Blairite councillors - "support your programme in local government, who are carrying through cuts?" We do not want another 1931, where "the right kept quiet, and then stabbed the labour movement in the back," forming a 'national government' with part of the Tories. "Those people who are opposed to Corbyn, at council level, we will oppose them. By all means possible." "Why did the Russian revolution triumph? It was the Bolshevik Party" and its policy of "no compromise with the capitalist enemy." "Long live the Russian revolution. Long live Marx, Engels, Lenin and Trotsky" and all the "nameless heroes" of the working class. "Long live our own revolution... That is a future worth fighting for." Workers in the PCS union, organised civil servants, rank among those heroes today. The Tory pay cap has straitened public sector workers' lives for seven years. "And our answer," said Chris Baugh, the rally's opening speaker, "has been a consultative pay ballot, with 99% voting to reject the pay cap - and nearly 80% in a vote to take action." 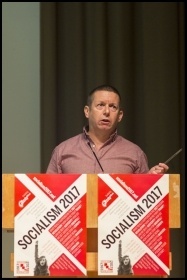 Chris is a long-standing union militant and Socialist Party member. He's been elected assistant general secretary of PCS since 2004. "I'm proud of the contribution I've made over three decades of work." This includes "helping defeat one of the most reactionary leaderships in the British trade union movement in the CPSA," predecessor of the PCS. Cabinet papers released this year prove a "conspiracy between the Thatcher government and that right-wing leadership." Union bureaucrats connived to deny John Macreadie, a supporter of Militant, the Socialist Party's forerunner, his elected position as leader. And last year, "the mother of all recruitment exercises" foiled a Tory manoeuvre aimed at removing thousands of union members. Chris wants to build "the coordinated industrial action needed to force back such an enfeebled Tory government." But "to counter the vast imbalance of wealth and power between capital and labour" also means "offering an alternative to a failed capitalist system: offering the vision of a socialist society." Alternatives are rising again. Ian Mearns, Labour MP for Gateshead, is one of Jeremy Corbyn's few allies in Westminster. "In the Labour Party now, nationalisation is no longer a dirty word. "And guess what? Socialism isn't a dirty word either." "Comrades, this government isn't on the verge of crisis. It isn't about to collapse. It is collapsing." Meanwhile, Ian says, Labour is "not reunited, but we are reuniting." This is one of our points of difference. A battle is needed to kick out the Blairites. Ian is a former member of the Militant-led Labour Party Young Socialists (YS). He wants Labour to become a "campaigning movement" again. "We've never done political education. The political education I got in the YS was from the YS and the Militant!" Corbyn's promise of "nationalisation of the railways and water isn't revolutionary." But "socialism is now re-emerging as a mainstream concept." National liberation struggles are re-emerging too. Coral Latorre is general secretary of Catalonia's Sindicat d'Estudiants (students' union). "People tired with the rule of the Spanish and Catalan oligarchy have filled the streets to fight against those who impose austerity and oppress us." The Sindicat d'Estudiants organised four student general strikes, leading to a general strike of workers. 150,000 marched in Barcelona. "It was proved that with mass mobilisations, of course we can defeat an unjust law. And it doesn't matter how many times the state tried to forbid the referendum, or how many policemen they sent." "We see that revolutionary potential in the movement." But we do not fight to install "the same Catalan ruling class that have provoked misery." "Els carrers seran sempre els nostres: the streets will be forever ours. For a socialist Catalonia. For a socialist world." 2017 also marks 40 years since mass pickets defended low-paid strikers at Grunwick - most Asian, most women. 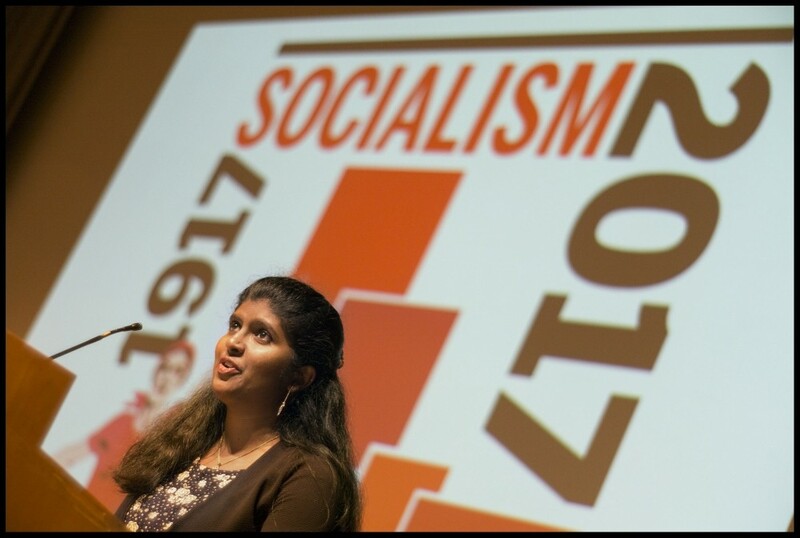 Socialist Party member Isai Priya of Tamil Solidarity said that today, "refugees living in Britain are amongst the most oppressed in our society." They languish for years in detention centres. Inside they work for as little as £1 an hour, "cheap labour for greedy bosses." Outside "they are denied the basic rights such as the right to work or study." But the Refugee Rights campaign is led by refugees organising to win these rights. And they want the backing of the trade union movement. A block of refugees and supporters stood and brandished their demands. The shining smiles of class fighters surrounding them showed delight in finding new comrades in the struggle. That struggle needs resources. "Lenin looked at finance as a measure of the strength of Bolshevik support in the working class," said Paula Mitchell, Socialist Party London regional secretary. Paula presided over a stunning collection. Goal: £30,000. Received: £42,021. "You could say that socialists are the original crowdfunders." But new, mass participation does not end at donation. "Millions of people are now clamouring for a left-wing agenda, even a radical agenda, something the Democratic establishment is not prepared to give." Kshama Sawant, Seattle city councilmember for Socialist Alternative, the Socialist Party's co-thinkers in the United States. "For all the candidates who have won this year on the Democratic ticket - we will need to see. This will be a test." Trump's administration is in "crisis mode, month after month." But the bosses are "caught in a vice grip." Neither party dares move to impeach. "They fear the damage to the whole establishment." Socialist Alternative lights the way with its audacity. It helped mobilise 50,000 protesters after Trump's election. It shut down Seatac airport to oppose his travel ban. It led the victorious fight for a $15 minimum wage in Minneapolis. And "while the right wing has been emboldened enough to call their own rallies, including in Charlottesville, the response, the counterprotests, have been even larger." "We are indeed moving into a stage of revolt." Sunday closing rally: "Socialism is back!" 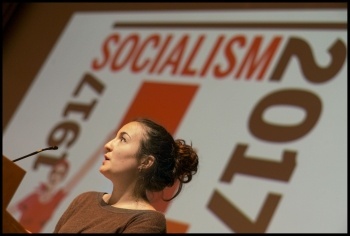 The themes of workers, youth, internationalism and socialism - which ran through the whole weekend - were reflected in the four speakers at the closing rally: national chair of Socialist Students Theo Sharrief, assistant general secretary of Unite the Union Howard Beckett, Irish socialist MP Paul Murphy and deputy general secretary of the Socialist Party Hannah Sell. Theo explained that on budget day on 22 November Socialist Students is organising an education shutdown - local protests, walkouts and occupations - in response to what will no doubt be yet another budget offering nothing for young people. 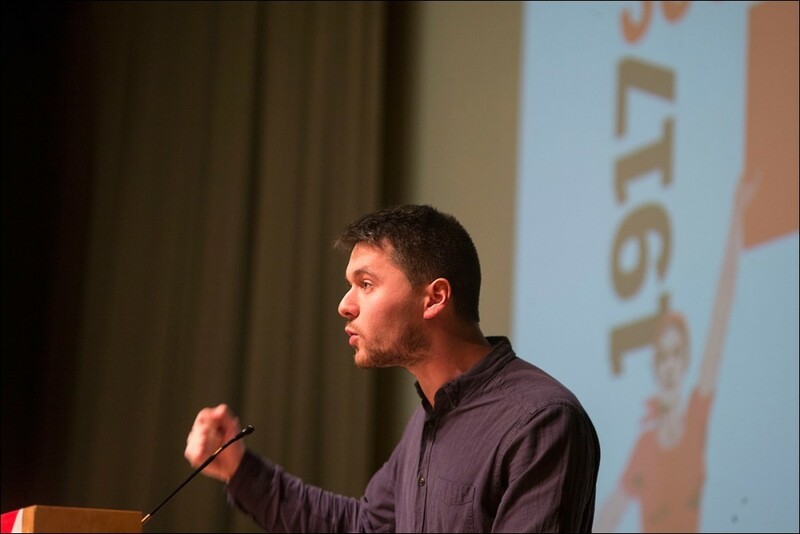 Pointing out the failure of the National Union of Students to take such a lead, he said: "Either get brave to lead the battles that are ahead or we will build ourselves a new leadership worthy of the struggles necessary to fight for our futures." 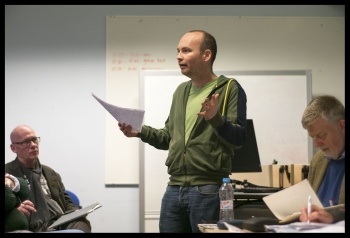 Howard said of the trade union leaders: "Our responsibility as leaders is to educate and organise." And part of that, he argued, must be to "call on Labour councils to act as socialists. "It's no good for them to act as complicit agents of the treasury, no good for them to hide behind budgets." "I will say clearly to all in the West Midlands who claim to be Labour but talk like Tories: if you act like a Tory, Unite in the West Midlands will treat you like a Tory. 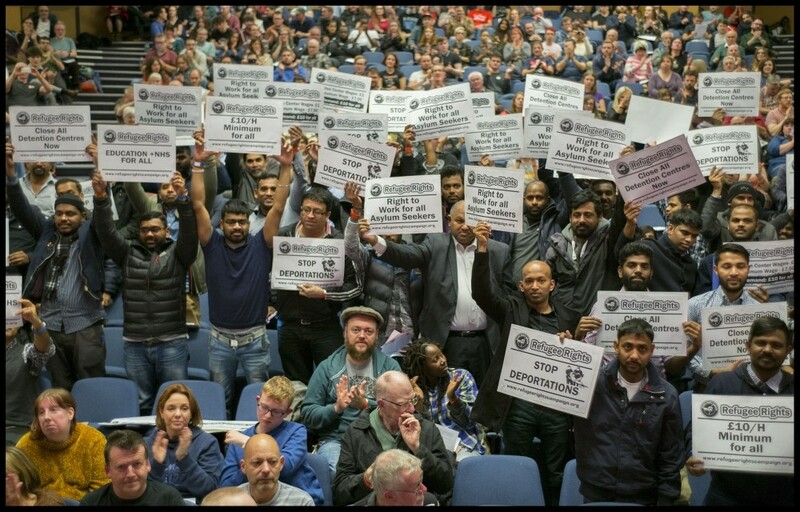 "If justice and socialism is not the drive for Birmingham councillors to behave as Labour, then perhaps next May's city council elections will be. "Because Unite in Birmingham will not support any Tory, even those who are labelled Labour." When she spoke, Hannah added that Corbyn and the Labour leadership "should insist councils say they will use reserves and borrowing powers so as not to make any more cuts. "And Labour nationally can say any money spent locally fighting austerity we will reimburse when we're in government." Since Paul spoke at last year's Socialism event, he and five other protesters were found not guilty of false imprisonment of the then deputy prime minister on a protest in 2014. "This was a collective victory of the Jobstown Not Guilty campaign, of the trade union movement that supported us, and particularly of our international, the CWI." This massive defeat for the Irish establishment was mirrored by their defeat in the Citizens Assembly. They set up this body to try to get a recommendation for very minor changes to abortion law in Ireland. Instead it recommended a pro-choice position. Paul highlighted that the Socialist Party (our Irish sister organisation) is at the forefront of the movement for abortion rights. Hannah reminded the room of the contrast during party conference season. "On one side was Corbyn talking about standing for socialism in the 21st century. "On the other was the Tories' response. That free market capitalism is unquestionably the best means of increasing living conditions for everyone in the country. "Tell that to the people in 2016 who were hospitalised with malnutrition in supposedly the sixth richest country on the planet." In the fight to change these conditions, Hannah highlighted the important role the Socialist Party has played in a number of campaigns. "We achieve what we do," she said, "primarily because of our ideas, because we have a clear programme for a new society. But while ideas are crucial, without organisation they are nothing." She went on to explain that the Socialist Party faces eviction from our national headquarters for them to be turned into flats - part of the gentrification so prevalent in London. We will therefore need to initiate a financial appeal towards new premises and Hannah announced that we are able to launch that fund with a donation of £45,000 from ex-MP Dave Nellist. Dave followed the Socialist Party's policy of living on a workers' wage rather than an inflated parliamentary salary. The rest of his pay he used for campaigning and labour movement causes - and is now doing the same with his parliamentary pension. 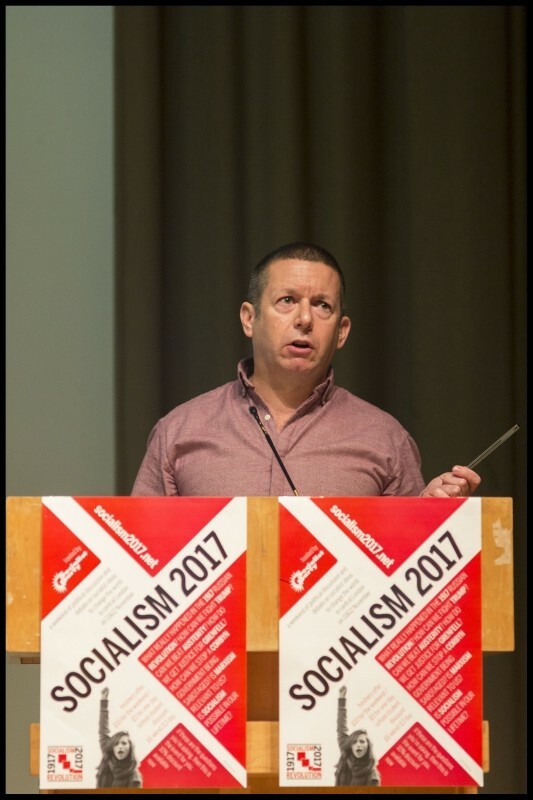 In closing the weekend, London Socialist Party organiser and chair of the rally Paul Callanan, said: "The class struggle in Britain and internationally has entered a new phase. 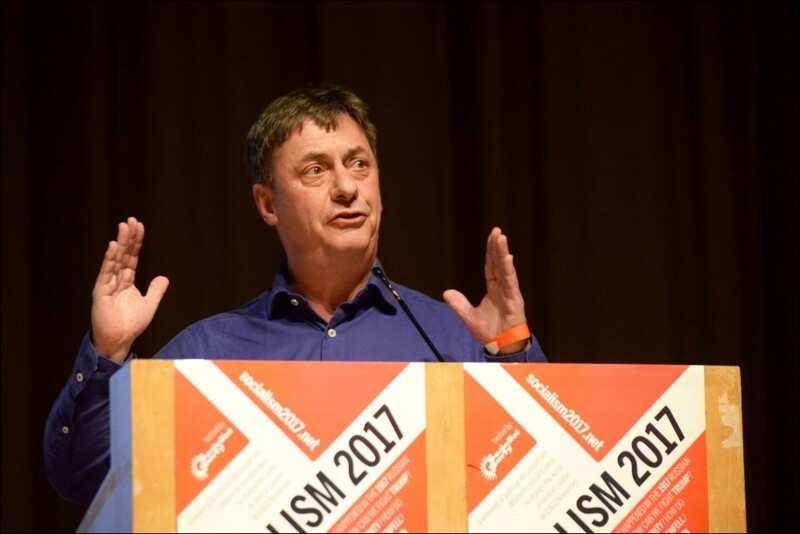 "Working class and young people across the world are building new movements, building new parties and looking for an alternative to capitalism... socialism is back!" Socialism 2017 was one of the best and most inspiring times of my life. Having looked forward to this event since joining the Socialist Party earlier this year, I have to say it exceeded all expectations. It was a privilege to listen to such a range of courageous and inspirational speakers on the struggles faced by the working class throughout the world. To see so many people who care about the plights and rights of the oppressed and the ordinary coming together and organising to fight back was a profound experience. I was deeply moved listening to the speakers on the platform and those from the floor. 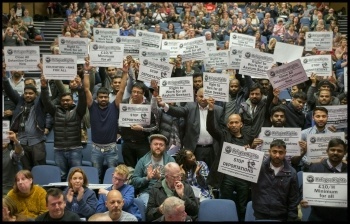 The passion and dedication of members across the globe, and the battles fought and won gave a real sense of hope and positivity of what we as a class can achieve if we stand united together against capitalism and corruption. It was particularly uplifting to see so many younger people involved with the movement and their enthusiasm and commitment to creating a better world for us all. The forum on women and the fightback not only showed the inspiring role ordinary women played in the Russian revolution but also their continued efforts to fight for equality and women's rights today. After Saturday's rally the trip to the Skinners Arms and stint in The Clink added yet another highlight to the weekend and it was great to meet, exchange ideas and socialise with members from all over. You could not have asked for better company, nor a more welcoming and friendly atmosphere. This was my first time attending Socialism, but it certainly won't be the last. And I'm still humming the Internationale! Feel a little taller, a little wiser and immensely proud of the party I belong to - fantastic comrades doing amazing stuff around the world and around Britain against all sorts of odds. Well done and a huge thank you. That was a fantastic weekend. I learned from some excellent speakers, had a great time with members from around the country and left hopeful and reenergised! 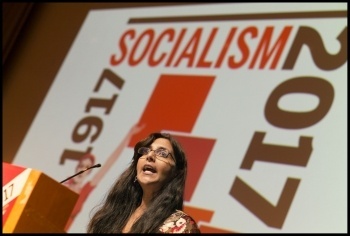 Thank you to the Socialist Party for the highly informative and inspirational conference. The overall experience has provided a uniquely beneficial opportunity not available elsewhere and the lessons learned will be vital in my personal and political development as a socialist. See you all again next year! It was an excellent weekend. As always the highlight of the weekend is hearing the reports of the struggles our comrades internationally are involved in. In Ireland for the right to abortion, in the US against attacks on the homeless and in Catalonia against the brutality of the Spanish state. Came away energised for the battles to come here! The biggest and best yet! From sessions on the ongoing crisis of capitalism to what went wrong in Venezuela, it is clear that our party has the best ideas and the best tactics to transform society for the better. The rallies were inspirational and the mood was optimistic and vibrant. After spending the weekend learning and hearing about the magnificent October revolution I got the 19-17 train home from London Euston! Long live the revolution! For me, the highlight of Socialism 2017 was hearing about the inspiring work of the CWI worldwide, particularly the role our sister parties are able to play in the US and Catalonia. Both are shining examples of how relatively small organisations can play important roles in political struggle if you have the correct programme and adopt the correct tactics. I'm a member of the Socialist Party in Scotland and a Unison steward. I was encouraged by fellow Socialist Party members and my partner to attend this weekend. At first I said no as I thought it would be too much and quite intense for me to take in, as I had never been before. I suppose I didn't know what to expect. But I decided to go and I can honestly say I wasn't disappointed. I enjoyed the weekend from start to finish. All the speakers spoke with great passion and determination and made it clear that there's no better time than now to change society for the better. 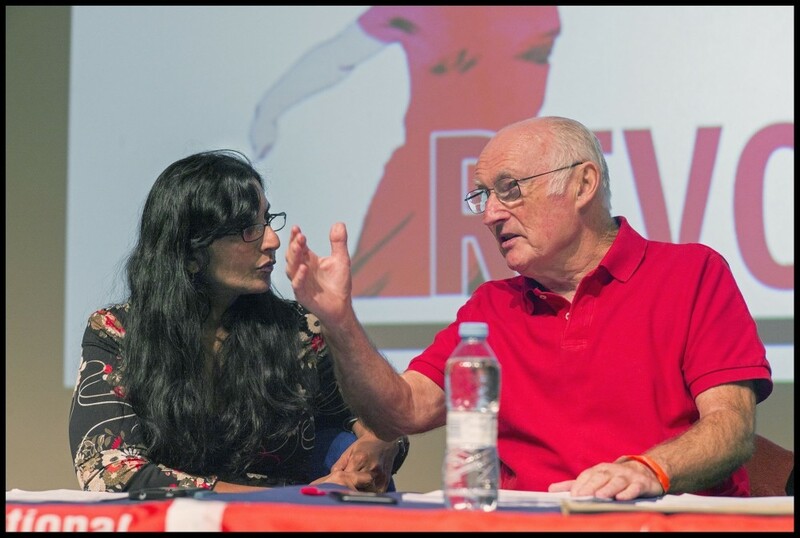 I enjoyed Kshama Sawant's session on the US, the women's forum was excellent, both rallies were outstanding and Peter Taaffe's speech at Saturday's rally was both inspiring and emotional. I came away feeling both motivated and inspired. I feel very proud to be a member of a party that stands up for the working class and I'd just like to thank my fellow members for encouraging me to come along. Also, a big thank you to everyone who was involved in organising such a weekend. I hope to see you all next year. I enjoyed the weekend. It was very well organised - venue and accommodation and the speakers were good. I enjoyed the 'socialism made easy sessions'. They were shorter and gave people ample opportunity to discuss and ask questions, one of my reasons as a comparative novice for going. As usual, the workshops were of exceedingly high quality, particularly the one on historical materialism, which has whetted my appetite for more reading! Both my girls loved the créche. My 3-year-old was gutted she had to leave. She's named her dolly after one of the women who ran it! I fully enjoyed Socialism 2017. Unite assistant general secretary Howard Beckett made a truly inspiring speech and explained his attitude towards the Tories and those Labour councillors and Labour MPs that act like Tories. Our Socialism event gets bigger and better every year. With this year's event being my first, I can gladly say that I was inspired. Having only been a member of the party for just over six months, I knew I still had a lot to learn. Thankfully, the sessions were extremely insightful. The information I learned has not only given me plenty of material to do lead-offs back at my branch, but also has given me hope and additional strength for my contribution to the fight against capitalism. I will definitely be attending next year's event. Thank you! The highlight for me was the main rally on Saturday, what an inspiration our comrades are! Kshama Sawant was absolutely incredible - and what our comrades in America have achieved is also incredible. I had a great stall selling my revolutionary bracelets. I made several different slogans which went down really well. I made £110 for the Fighting Fund. Anyone who wants to order any can do so through tigre3@talktalk.net. Any slogan you want - 'Marx was right', 'revolutionary', 'socialist' or any other. I attended on Sunday and enjoyed the 'how can a Corbyn Government avoid sabotage' and the last of the October revolution sessions. Great atmosphere at the final rally! Well done to all the speakers and organisers. The best thing about Socialism is the opportunity it provides to discuss and learn from other comrades, ultimately making us a stronger force. I had a really good weekend. I'm suffering a slight information overload but am slowly processing it in my head and possibly driving all my work colleagues mad with all I've learned. Thanks for making me feel so welcome. My first Socialism was informative and inspiring. Having MP Ian Mearns speak was an incredible experience and I look forward to next year. I spent it all in the Marxist theory seminars. This morning I realised how reinvigorated I feel and how I actually did reach a new level of understanding. 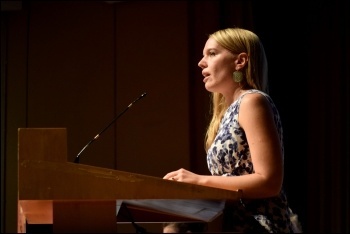 Really enjoyed the speakers in the main hall each afternoon - we've got a talented bunch of orators on our side. Organisation was fantastic too. Thanks to all. I thought Socialism 2017 was a worthy celebration of the centenary of the Russian revolution. The session on Catalonia confirmed that we are following in the footsteps of the Bolsheviks and European and world revolutions are developing. The mood was confident and optimistic. Looking forward to Socialism 2018 already! Our coach was buzzing on the long journey back to Wales. Ideas, programme, strategy, tactics and methods are paramount. But you also know you are in the correct revolutionary organisation when you hear a left-wing Labour MP saying that he owes all his political education to the Young Socialists and Militant (predecessor of the Socialist Party). Then the assistant general secretary of the biggest union in the country saying the Socialist Party has always been on the side of the working class. Then that former Labour MP Dave Nellist, who took only a worker's wage while being in Parliament, is now taking a worker's pension and donating £45,000 to the Socialist Party. 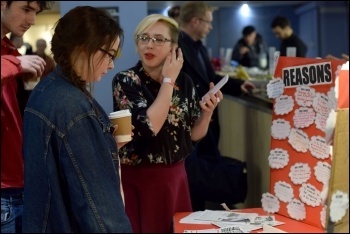 Great Socialism 2017 event! What a great and historically best ever socialism! Thank you. Excellent and inspirational event. Speakers were brilliant! I think the participation of members from other countries makes it a truly international event - Spain, Catalonia, Ireland (north and south), Scotland, Nepal, Malaysia, South Korea, Austria, Turkey, Germany, Portugal, Cyprus, United States, Sri Lanka, France, Kurdistan, to name just a few. The Fighting Fund collection at the main rally raised an incredible £42,000! So good to meet many new people and people I had just known on social media. 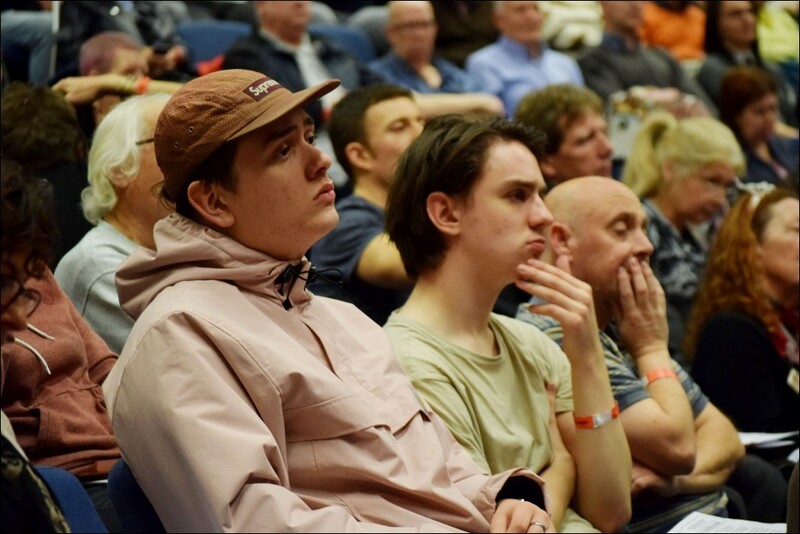 For a very old hand like myself it was a great boost to my morale to see so many young people, as well as the seasoned socialist fighters, at Socialism 17. 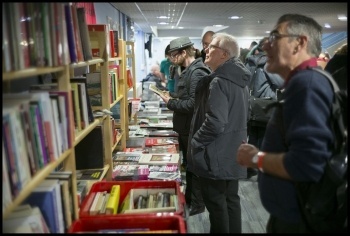 This was evident from the record sales and queues that the volunteer book stall helpers could hardly keep up with in the breaks. The large increase showed the thirst for socialist ideas. Also the readings by authors Edward Wilson and Meena Kandasamy were obviously well received as their titles sold out. 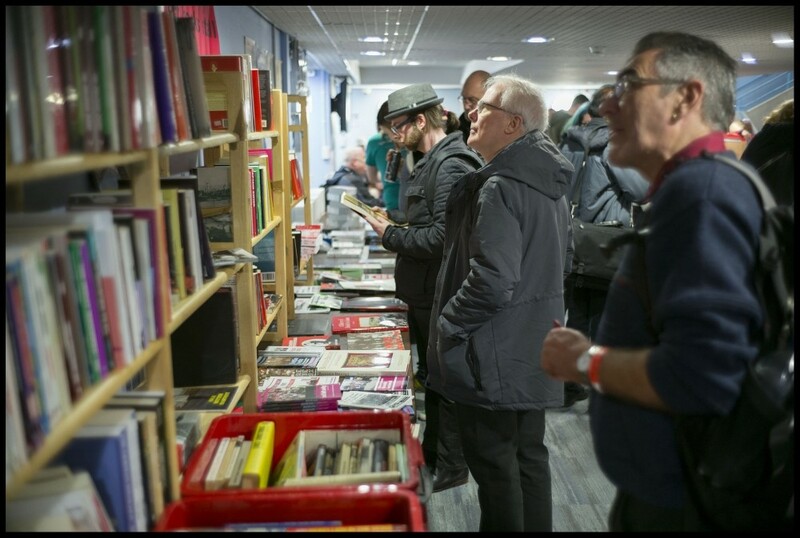 In addition, the sales of the Socialist Party's new publishing house Socialist Books were excellent. Peter Taaffe's 'From Militant to the Socialist Party', plus a new edition of Trotsky's 'Lessons of October' created big interest. Thanks and congratulations to all organisers and helpers. This version of this article was first posted on the Socialist Party website on 14 November 2017 and may vary slightly from the version subsequently printed in The Socialist.